Eleaf puts a new spin on an old workhorse. The iStick Pico 100w adds more power, longer battery life, without adding bulk. The looks grab your attention, but the performance is what keeps you happy. This box mod utilizes the body to house a huge 21700 cell battery and chipset in a nice futuristic color scheme (without looking cheap) that screams quality when you wrap your hand around it. As solid as this box mod is, the Ello Vate tank it comes with is what really helps this one seal the deal, firing up to 100watts QUITELY. Newbies hankering to switch over to the wonderful world of vaping are often plagued by a myriad of choices that can often feel overwhelming. If you fit into this category, then the Eleaf iStick Pico S 100W just might be the kit for you. The kit comes with an Avatar AVB 21700 battery straight out of the box, meaning that there's no need for you purchase a battery separately. The included battery is rated for 4000mAh giving heaps of battery life which should easily get you through a day of high powered vaping. 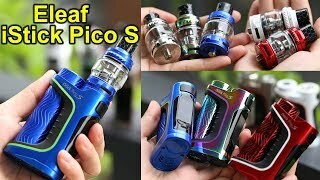 As one of the successors to the original iStick Pico, the iStick Pico S shares a lot with its older brother when it comes to the overall design. While the fire button remains largely unchanged, the up/down buttons have been relocated from the bottom of the mod to the side, right underneath the display, making them a lot easier to access compared to the previous design. The minimalistic look of the original Pico is now replaced by a much flashier tri-tone colorway, with the battery sled now contoured giving the entire mod a double barrel-like aesthetic. Obviously, the biggest change over its predecessor is the iStick Pico S now fires up to 100 watts, giving you much more headroom when firing up bigger coils, allowing more flexibility for custom builds. This pairs perfectly with the included Ello Vate tank which uses coils ranging from 0.15 to 0.2 ohms (included in the kit), ideal for builds where maximum cloud production is sought after. The Ello Vate has a relatively smooth airflow design which makes it less turbulent or whistly even when dialing down the airflow ring to a bare minimum. For owners of the original iStick Pico who loved the portability of the mod but felt restricted by the single 18650 and maximum 65-watt power output, the all-new iStick Pico S is looking to be a worthwhile upgrade. Even absolute beginners will appreciate that the kit already comes with a powerful battery, giving them everything they need to start their vaping journey. Tack on a variety of supported vaping modes such as temperature control, TCR, and pre-heat wattage mode, and you've got a potential winner in your hands.